Tropical Storm Chedeng has strengthened and signal warning has been raised for the province of Catanduanes in Bicol. 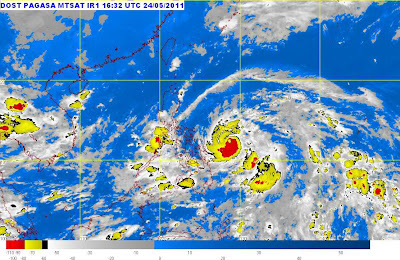 According to PAGASA's latest bulletin, 11 PM Tuesday, May 24, 2011, Bagyong Chedeng is now located 20 km East of Catarman, Northen Samar and has a maximum sustained winds of 115 kph near the center and gustiness of up to 145 kph. Storm signal warning has been raised from No. 1 to No. 2 in Catanduanes, while Signal #1 for these areas / provinces: Albay, Burias Island, Camarines Norte, Camarines Sur, Samar Provinces, Sorsogon and Ticao Island. Based on forecast, Chedeng is located at 150 km North of Virac, Catanduanes by Wednesday evening, in the vicinity of Isabela, Cagayan on Thursday evening and at 80 km West of Basco, Batanes by Friday night. The next bulletin / update for Bagyong Chedeng will be issued at 5AM today.